The Ring of Fire is an area of the world around the Pacific Ocean where many of the tectonic plates that make up the surface of the earth rub together. This constant movement, including scraping and sometimes overlapping of the plates, allows magma (hot molten liquid within the center of the earth) to move to the earth's surface through these cracks and gaps and volcanoes occur. 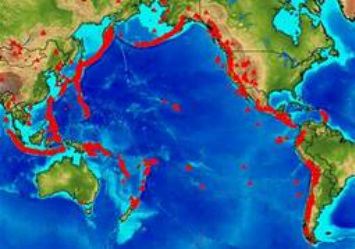 Earthquakes also frequently occur in this Ring of Fire geographic region because of the moving and scraping of these plates on the surface of the earth (the earth's crust). 75% of the world's volcanoes are located in the Ring of Fire and 90% of the world's earthquakes happen here as well. Amazing! 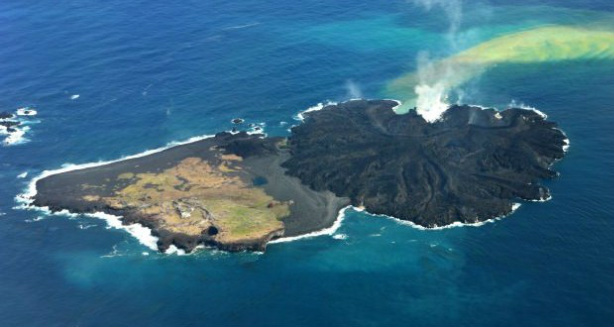 On March 30th two islands in Japan, located in the Phillipine Sea merged (combined) into one island when the volcanoe on on of the islands erupted. Sometimes we think of science happening slowly. It is amazing to watch this volcanic eruption as it is recorded on camera by the Japanese Coast Guard. I hope that you will watch the video that shows Niijima Island erupting and the lava spreading across to reach the sister island of Nishino-shima. In time, they merge and become one island. Click here to read a news article explaining this scientific event from the Canada Journal.